Imagine being able to ride over the bridges! This summer we had the first Bridge Bike Shuttle to get you over the bridges with your bike. 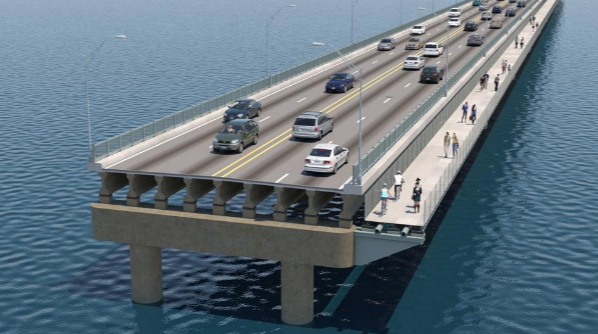 Imagine the day when we won’t need that because you’ll be able to pedal yourself over the Narragansett Bay. As you can imagine we’re THRILLED to be talking about this prospect and excited to be part of the discovery process. To help deliver this ambitious vision we will be working closely with the Rhode Island Turnpike and Bridge Authority (RITBA), the city, state and a broad range of other organizations. Bridge infrastructure for bikes and pedestrians returns consistent high economic and health benefits. The studies are extensive, numerous and consistent. We’ll explore this prospect together and look to deliver on a truly promising dream for 21st century transportation for our island and our region. Thank you Buddy Croft and the Rhode Island Turnpike and Bridge Authority (RITBA)!